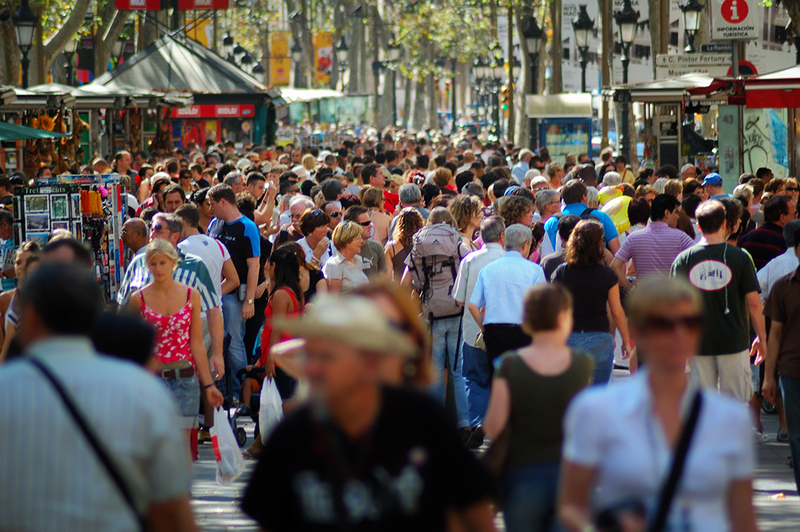 Las Ramblas, a small scale Catalan version of the Champs Elysées, is perhaps Barcelona's most frequented street and not precisely by the locals. Hordes of tourists wander up and down around the clock under the plataneros (hybrid plane trees) of the famous walk. This is how it looked on a Saturday morning last month. Recently, authorities met the local guild of stall owners to listen to their complaints and they have started cleaning Las Ramblas from pickpockets, trileros (a sort of shell game swindlers) and other petty criminals. In return the stalls will be replaced more than a meter backwards so they are not another obstacle in the way. Workers alleged that the living statues are also responsible for jamming the area as each of them gathers their own circle of admirers. Besides, there is the ever growing number of visitors. Did you know that according to a recent report by Saffron Brand Consultants, Barcelona is the third most attractive city for tourism, business and foreign investment after Paris and London from a list of 72 European cities. The data was obtained after interviewing 2000 people and considering different factors such as location, culture, history, food, business potential and residents attitude towards visitors. still, the weather seems extraordinary nice!